A friend sent an SMS (Short Message Service) or text message about a son being grumpy over fixing his bed asking his mom why would there be a need to do so when it's going to be disordered anyway as soon as he gets back to bed to sleep again; and went as far as to compare such disarray with love complaining that to love means to be hurt anyway so why love at all? His mom teasingly asked if he was an "emo" and told him that if he was, he should not be eating anymore since the food will be digested and be rid of anyway. 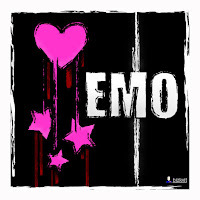 I had read a few more SMS from the same girl friend, all of which has the word "emo" at the end as if its a signature. If the aforementioned SMS as well as all other SMS she sent describes emo, thus emo may seem like a hyperbole because every sad experience, particularly in love and sexual relationships is either exaggerated when trivial or highlighted when noteworthy as if those who never experience complicated love affairs are as good as dead and those who do are heroes being celebrated due to their rise from defeat to victory. Emo has been popularized in different ways: music, culture, philosophy, and fashion; and affects mostly straight male or female ranging from teenagers to the 30 something from all walks of life. Fashion to start with is observed thru hairstyle, clothing, accessories and make up as well. Hairstyle is usually the unkempt type with uneven strands and length which may be covering half the face or could be short and streaked with blue, red, pink etc. Clothing and accessories are relatively similar to goth and rock respectively; since goth outfit is black too and punk is also symbolized by expressive accessories which by some people's standards seems like evil of some sort. Although music is the predominant aspect of emo, it is the philosophy behind it that strikes the best chord. Then I stopped with that, out of laziness of course but may even be because I end up thinking what's with all the wiki-like definition of all that is emo? I am not even interested with all the vivid details because all I ever wanted to think about is how emo (in terms of music and idealism) in spite of the supposed darkness enshrouding it, scatters the clouds that darkens my thoughts. It is like a poem to a poet, music to a musician; it is apparent danger that I will not shy away from but will rather freely succumb into knowing that behind its overpowering shadows, I will be rid of my troubles. Contrary to the common misconception of emo in that all it supposedly does is to idolize death and suffering, it's the other way around for me. When I elevate pain and failure, it is not to focus on it to the point that it becomes a part of me; I bring the lowest point of human emotion to a higher level just to express myself so as not to keep it all within like a volcano does until it suddenly bursts to annihilate everything and everyone around it. It feels like sweat after gym, liberates you physically that you feel better inside after you're done. Although I can name a few television shows to be emo in nature (particularly some anime), emo is best heard in lines from songs made popular by some bands of today which were already labeled "emo" whether they do think they are or not. Had I still been the self-proclaimed music via the arm chair critique that I was a few years back, I would have dismissed emo right away (as if I had the so-called "say" about it) as no less than commercialized music with emo bands no more than boy bands pretending to be stylish enough to be named as emo simply because emo may sound rockish in a way. Yet I am no longer the blogger that I was back then, arguing with guys older and more experienced than I was when it comes to knowledge of differing music genre particularly of the rock scene so then I take it back. Emo is certainly not such and emo bands are definitely not so like that. ;) Anyways, most emo bands do not even believe they are emo. They mentioned that there music, though seemingly full of pain and drama like emo, celebrates the liberation there is to simply show who you are and say what you really feel in the form of words and music. I'm sure that's what other bands or other artists probably believe as well whether they are categorized under "emo" or not. This is the kind of emo I personally believe in: the unabashed verse singing about one's defeat in life, be it as cheesy as a forlorn love affair or as provoking as suicidal thoughts because at the end of the rhymes there is the challenge to get up and go on if not, the victory over pain and despair. Even if technically two-thirds of a song is downcast in nature, at least its one-third is good enough to encourage a broken heart not to be bitter but to search for a better person within himself after the rain pours, and to lift up a fallen mind to rise from whatever hopeless situation he is at. I know there was never a story written with perfect conclusion as they say because in this ever changing world, there is something new that comes to mind each time; yet I am sure that I was able to say all that I really wanted to say about emo, turns out I just have to skip the definition part (which caused a lot of writer's block anyway) and jump right into the soul of the matter. So if I say I think like an emo does, it don't mean that I am suicidal nor hopeless nor broken hearted always, it means that I express the pain there is in whatever failure through songs and words then look forward to something brighter afterwards.